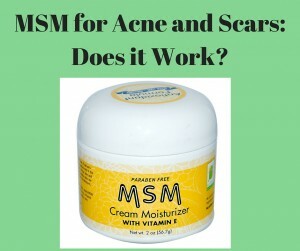 If you are considering using MSM for acne, read on to learn about MSM creams and supplements that can help acne as well as acne scars. MSM for cystic acne can be especially helpful for some people. Methylsulfonylmethane (MSM) is a natural sulfur compound produced by the body that helps with forming the bonds between protein molecules. A lot of people take MSM supplements as a part of their regular diet to help with many internal bodily functions as well as external parts such as the skin, hair, nails, and joints. There isn’t a lot of definitive research done on all the claimed benefits of MSM, but those who use it will swear by its good effects. Some of the claims include increased energy, better moods, strong concentration, detoxifying the body, and calming inflammation. 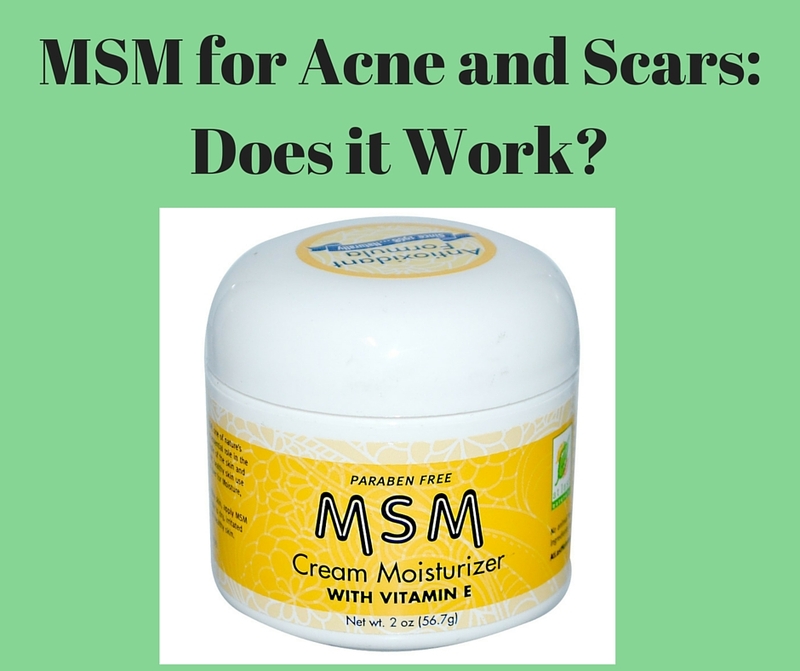 CAN YOU USE MSM FOR ACNE? One of the main uses for MSM currently is in the treatment of acne and acne scars. Because of its effect on the skin proteins, this compound can not only make your skin softer and suppler, helping to get rid of scar tissue, but it can also help to regulate your pores and glands. The anti-inflammatory properties help to calm down acne breakouts and clear off any blemishes on your face. Ingesting or applying MSM can help your acne and acne scars; although some people say that topical treatments have a stronger effect on the skin than internal supplements that spread the benefits around. Topical treatments are most likely to do more if you want to use MSM for acne scars. You can get MSM in a variety of forms within the US. Most people chose to buy it as a cream, capsule, or powder, but you can also get it in gel and flake forms if those suit you better. Using MSM for acne is an effective way to help clear up your skin while improving the overall quality, but it’s important to remember that this compound may not be what your specific acne needs as a treatment. Not all acne is created equal, and although using MSM for acne scars is likely to work for most people, MSM for acne might not have the drastic effect you’re looking for. Then again, it might clear up all of your acne as it has for others, so it’s worth a try! Ingesting MSM in the form of powder (mixed with water and some form of vitamin C) or capsule supplements is one of the most popular ways to treat your acne as it’s easy to do, works alongside your normal skincare routine, and generally spreads similar benefits around your whole body as topical creams do to targeted areas. MSM FOR CYSTIC ACNE – DOES IT HELP? MSM is a popular supplement for treating cystic acne. The anti-inflammatory properties are useful for reducing the size of cysts and nodules that are under the skin. The best way to use it for cysts is to apply a topical cream to the area so that the effects are stronger and more concentrated. You can also take MSM supplements for acne cysts and nodules with some of the same effects, although they might not be as targeted so the cysts can take longer to reduce in size. I’d posted a video earlier about my first impressions of At Last Naturals MSM Cream. I’d heard all the hype about how MSM creams can fill up acne scars by helping skin regenerate lost tissue. Here is a link to my previous post about experimenting with MSM for acne. The video is worth a watch as it will hopefully give you important information about the product. This cream combines the healing powers of Aloe Vera with the MSM ingredients to make a mixture is excellent for your face and body. As a naturopathic cure, you can be certain that all the ingredients in here are both natural and useful to your body. This is a great cream for your face and it can help with skin health and hormone imbalances to target different sources of acne. This gel absorbs quicker than MSM creams and has a very similar effect on the skin. It is mostly used for the benefits such as joint pain relief, but it can also work for you acne. This supplement is made with non-GMO ingredients that can give you the full benefits of the MSM for your skin and overall health. Premium ingredients are sourced from the US for these supplements that are contained within a vegetable-based dissolving capsule. This is one of the purest forms of MSM on the market. It’s 99.9% pure, quadruple distilled to remove any additives, and is made from naturally occurring MSM. Made in the same way as the flakes above, this MSM is powdered into tiny crystals that will be easier to dissolve in water and drink. While this brand is focused more on the joint pain relief, the benefits for acne fighting are still there just as strong. MSM for acne and acne scars seems to be a fairly effective form of treatment. It doesn’t seem to have as much effect on more severe cases of acne, except that the anti-inflammatory properties will help reduce redness in the area. Overall, the benefits MSM can give to the skin seem to be worth giving it a try either topically or as a supplement capsule or powder.